The Kyegegwa District chairman, Mr Norman Birungi, has applauded civil society organisations (CSOs) for raising voters’ awareness on development programmes through public education. “The voters of 2016 are far different in thinking than those we had in 2006 and 2011. They are more aware than before because of the public dialogues we hold with them through the CSOs,” Mr Birungi told Saturday Monitor on Monday. A recently concluded Situational Analysis Report focusing on the Education Department in Mayuge District, Eastern Uganda, found that voids exist in the flow of information between citizens and leaders, leading to restricted participation in decision making processes. The poor flow of information in the sector has contributed to poor service delivery and a negative attitude amongst some members of the community towards funding their children’s education. It was revealed that some citizens, including local leaders, did not know where to find information on education or had no way of reaching information points including the district headquarters. Reports of information hoarding had further strained the school-parent relationship, resulting in parents calling for more involvement in the management of schools. The 15 advocacy forums have been formed by the 120 rural monitors trained by ToroDev in online advocacy, monitoring service delivery using online social media/ICT tools like Ushahidi platform for online documentation, visualization and mapping. The Advocacy Forums also use FM Radio Broadcasting as an ICT tool for “convergence or hub” since it is the most accessed media channel in the rural areas of the Rwenzori Region. “During the physical and Skype meetings and discussions ToroDev M&E team encourages the leaders of the 15 advocacy forums to embark on advocacy activities-monitoring service delivery, demanding accountability from local leaders and ensuring the participation of the marginalized groups such as women and youth. The team also tasks forum members to implement ratio of 40% as women, 40% youth and 20% adults in our forum memberships and additional information on social accountability” Said Amanya Sheila M&E officer ToroDev. Sheila adds that as a team we encourage and support citizen-citizen engagements/deliberations to assess priority service delivery and public accountability advocacy at sub-county levels in 7 district of Rwenzori regions, through the existing 15 Advocacy Forums and also through daily facebook discussion with Forums that have computers connected with Internet and monthly phone calls the team tries to verify whether the 15 forums are still active in monitoring services and advocating for better services, whether they conduct monthly accountability meetings, whether they invite leaders for accountability meetings, whether youths and women attend their meeting ( and the number of youth and women), whether they discuss issues related to public accountability etc. “We are always checked through phone- calls at-least twice a month by the team from ToroDev encouraging the leaders of the forums to continue using both physical meetings and ICT tools to advocate for improved service delivery and share the issues with the team both online and write a report which is submitted at ToroDev Offices every month, this has kept us active in doing our work”. Said Muhindo Ezra,the leader of Katebwa Advocacy Forum, Kabarole District. “As members of the advocacy forums we are always encouraged by ToroDev through phone calls, Skype, Face book discussions and physical meeting to keep using online/virtual platform for documentation and advocacy on people’s demands for improved service delivery in the seven districts of the Rwenzori region and participate on the Radio talk shows”. Said Rwaheru Gilbert the leader of Kichwamba people’and development Forum Kabarole District. As way of motivating, encouraging, strengthening and empowering the Advocacy forums and rural monitors, ToroDev’ M&E team attends the monthly meetings organized by the advocacy forums at the sub-county level, also twice in a month the leaders of the forums are given a call t to check on the progress of their work, holds Skype meetings with leaders who were given Laptops, this is done to assess the strengths, performance and weakness of the rural advocacy forums and rural monitors. “Mwenge north is one of the county that has not benefited from the Leaders we voted to go and represent us at the parliament and district level, for example in Katooke town council we have tractors to collect garbage, but they are just packed and garbage is everywhere in the whole town council, secondly people of Kahanda, Bufunjo, Kiswange and other villages are crying of lack of clean water, Katooke Health Center 111 does not have enough drugs and most patients now are only given Paracetamol. We are suffering in terms of having unimproved services because leaders during campaigns confuse and lie to voters promising them to provide services but they don’t provide any as soon as they win the votes, voters are always forgotten.” Said Tugume Joseph From Katooke sub-county Kyenjojo district during the Listeners forum talkshow live on Better FM. The panelists during the radio talkshow. 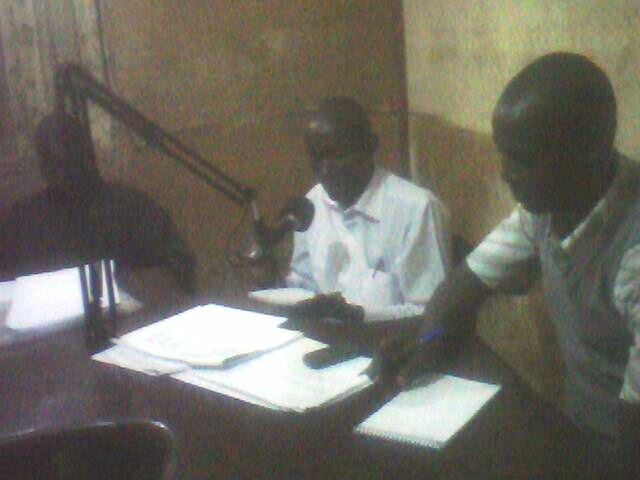 On 8th February 2015, Mr. Muntu K Willy district speaker from Ntoroko district and Mr Mwanguhya Kenneth a responsible citizen from HakibaleCommitted Citizen for Better service, Kabarole district were among the panelists who appeared on better FM to discuss the issue of politicians buying people’ votes during the campaigns to win elections. “Politicians who bribe people with money during campaigns fall in this say “USING MONEY TO GET MORE MONEY”. They think that if they are elected they will in 5 years of being in power will be able to harvest more money to pay back the money spent buying people’ votes such politicians don’t provide any improved services to people we need to learn a lesson from what we have seen so far “. Said Muntu Willy from Ntoroko district.